James Wong, a Chinese American self taught artist has been working non-stop for the past thirty years on his Future War marker drawings. 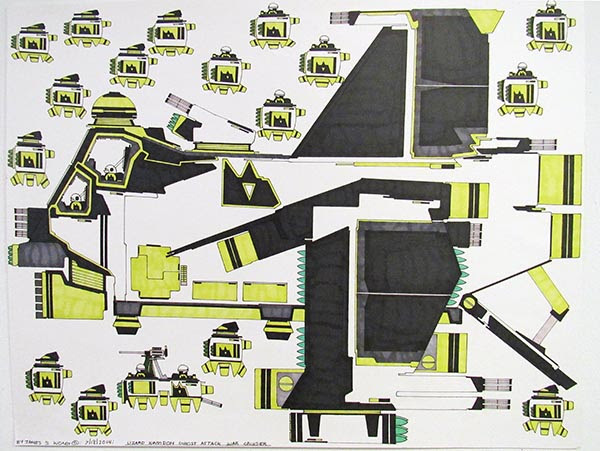 This exhibition, James Wong: Invasion of the Pods features his recent large multi panel works and the proliferation of pods– small flying ships, some that are robots, others with pilots. These works range from two feet to eight feet long in a narrative comic strip format. With an oeuvre of some six thousand five hundred drawings to date, James Wong is immersed in his invented worlds at war. Each military force is complete with its own logo, transportation fleet, war machines, arsenal, and personnel. Intense color, bold design and minute linear details are the calling card of James’ work. Drawings are created first with a black! marker outline and templates, then followed by intense colori! ng into the wee hours. In the artwork of James Wong, the iconography of model airplanes, comic books, and architectural blue print drawings merges with game design, avatars and war technology. Born in Hong Kong in 1972, James grew up in New York City Chinatown and went to New York’s Art and Design High School. His work has been exhibited at Cooper Union, Margaret Bodell Gallery, Henry Street Settlement, Cuchifritos and American Primitive Gallery, all in New York City. Chinese American Arts Council and Gallery 456 are supported, in part, by public funds from the National Endowment for the Arts; the New York State Council on the Arts with the support of Governor Andrew Cuomo & the NYS Legislature; The City of New York Department of Cultural Affairs in partnership with the City Council; and many other friends. This entry was posted in Exhibitions, Reception and tagged Broadway, Chinese American Arts Council, comic books, design, FUTURE, gaming, James Wong, Mary Ting, New York, robot, technology, war on March 8, 2016 by achang.